Shown above is a carved 3-D High-Density-Urethane (HDU) room number plaque with a sandstone texture sandblasted background. . 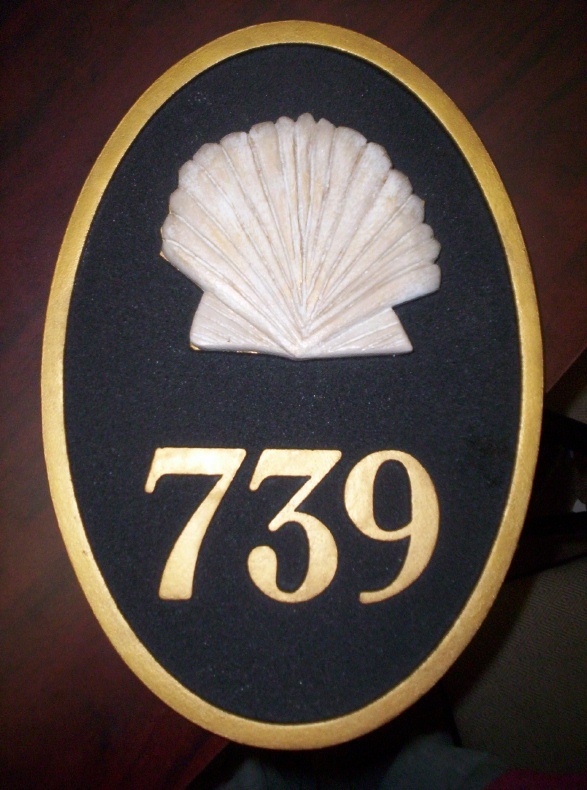 This handsome room number plaque features raised text, numbers and border, and a 3-D carved seashell. This plaque and similar ones can be made of painted High-Density-Urethane (HDU) or stained and painted wood of various species (e.g., Redwood, Oak, Maple, Mahogany, Cherry) . This plaque is hand-painted black and white with the border and numbers gilded with 24K gold leaf. The entire plaque is clear-coated twice. This room number plaque can be easily mounted with screws or epoxy on an outside wall, a room door, or an inside hall wall next to the room door.